Kerala is known to be one of the best tourist destination in India because of its rich culture, traditions, rituals and its breathtaking luxurious closeness with nature.Kerala has astonishing beaches on the Malabar coast, incredible rice fields, and various natural therapies offered by its stupendous nature which always attracts tourists from all over the world to have a memorable experience forever captured in your memory. What are the reasons to visit Kerala? Today Kerala has been selected by the National Geographic Traveler as one of the thirteen paradises on the earth. Relax on the golden sands of the beaches of Kerala, stretch out in the shade of the rows of palm trees along the beaches. The hill stations of Kerala are also a superb place for the tourists to visit. It is known for its green forest covers, calm and quiet backwaters. Feel completely relaxed as you enter a paradise where land, sea, and sky, come together in a union of elements. The cuisines are generally hot and spicy offering great taste and vigor, using plenty of fresh vegetables, exotic fruit, and locally-grown aromatic spices. 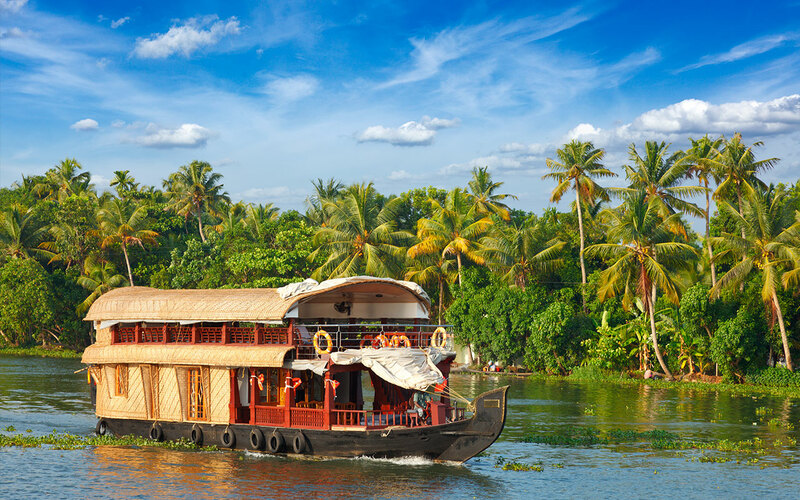 Alleppey is known for its unbelievable houseboat experiences and has been described as “Venice Of Egypt” by many travelers. Here, you find hundreds of houseboats, fishing boats, marvelous paddy fields, ducks, and awe-inspiring flowers like water lilies all around yourself which provide you peace and tranquillity.But, Alleppey is known not just for its backwaters but also it has many other attractions around it such as Pathiramanal, Arthunkal Church, Krishnapuram Palace, Bird Sanctuary, Marari Beach and lakes, etc. Places to visit: – Thiruvalam, Veli, Thiruvananthapuram, Alleppey. Kumarakom gives you the experience of traditional Kerala with authentic food and stays in a village. Kumarakom is the best place to take off and unwind yourself from the stresses of the world.It is said to have natural beauty with Vembanad Lake the largest lake in Kerala, Aruvikkuzhi Waterfalls where you get best photographs; you get to experience physical therapy. Plan your trip with MakeMyTrip Offers. Have you ever bathed an Elephant? Well, this is the most amazing experience of Kerala for tourist so far. This place is closely related to Indian mythology and tourist come here to bathe the elephants. Abhayaranyam is surrounded by forest which delivers you extreme tranquillity because of its rich flora and fauna. 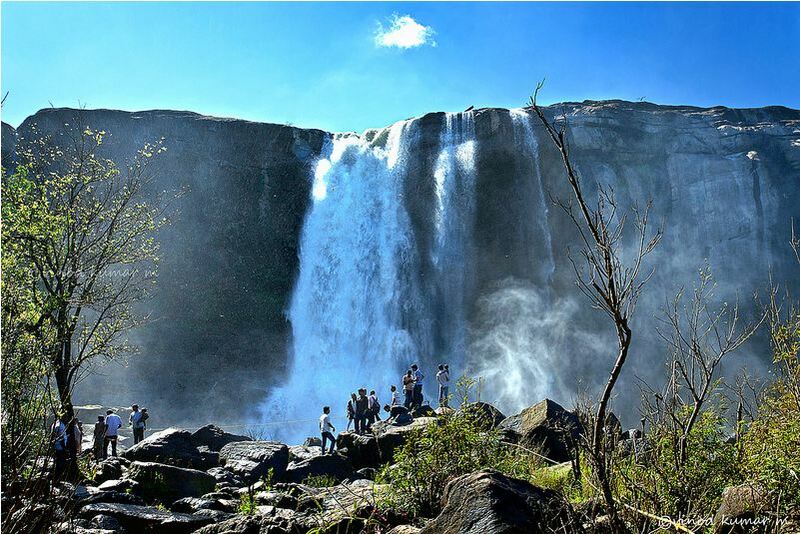 Places to Visit: –Wayanad, Pear, Chinnar. Spices have been an inherent part of Kerala, and this majestic place known for its spices all over the world from the day Vasco Da Gama came to India and started shipping its spices to Portugal.Anakkara is known for its high-end quality spices like cardamom, pepper, vanilla, clove, nutmeg, cinnamon, turmeric and ginger all over the world. Places to Visit: – Idukki, Kumily, Marayoor. Book cheap Air tickets to Kerala at MakeMyTrip Flight Ticket Offers. Kerala is located on the shore of the Arabian Sea and has a vast Shore of some of the most beautiful beaches. These beaches are covered with coconut trees, sweet sunshine, lagoons, natural harbors and most gratifying authentic seafood.The other eye-catching thing about the coastline and beaches is the constant availability ayurvedic massage and adventurous activities. Places to Visit: –Beypore, Cherai, Bekal. Kerala is widely known as God’s country because of its splendid natural environment, soothing climate, richness in herbs and medicinal plants. It is the climate of Kerala that gives it access to the Ayurvedic treatments of various kinds brought from Hindu mythology and practiced over 5000 Yrs. Natural herbs and ailments are used to replenish and rejuvenate your mind body and soul. Places to Visit: –Marayoor, Cherai, Bekal. Book bus tickets for an excursion in Kerala at MakeMyTrip Bus Offers. Kolukkumalai in Munnar is known for its highest tea plantation in the world. It offers you a wide variety of flavors in tea accompanied with inexhaustible freshness and aroma.Also, you get to visit the splendid tea plantation on high altitude. Kerala is a fusion of three major religion Islam, Hinduism and Christianity. The monuments of Kerala represent the early trade in India amidst the coconut grooves. Two must-visits are the Wooden Palace at Padmanabhapuram and Jewish Chapel at Fort Kochi. Adventure in Kerala is diverse because of its landscape which is a combination of land area and water. Travelers get many options to exult in Kerala such as Skiing, hiking, biking, wildlife parks canoeing and other water sports. Trekking is also essential adventure activity because of some of Kerala’s high altitude places. Places to Visit: –Idukki, Munnar, Vagamon. Much of Kerala’s alluring invocation is consolidated in the highland areas of the Western Ghats. 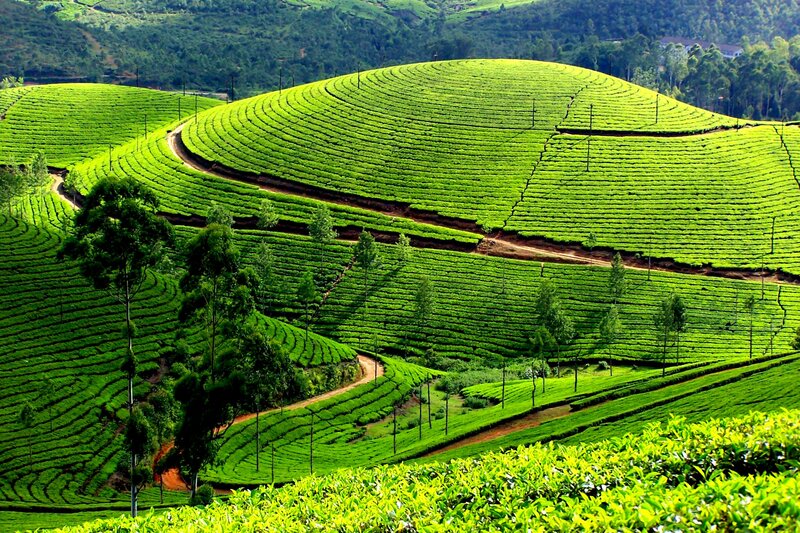 Kerala has many paradigmatic places for fresh air and hills offering the most comprehensive view with a fresh cup of tea. Places to Visit: – Cochin, Thrissur, Kannur. Peak Season which ranges from September to March. In these months the weather is warm and comfortable, but not hot. The wet and cold climate in monsoon weather is ideal for Ayurveda treatments and rejuvenation programs. The summer months bring a slower pace, humid weather, fewer crowds, and lower hotel rates in Kerala Tourism. Kerala is known as Gods Own Country because of the comfortable weather in all months of the year. What to buy from Kerala? Coir products are made from the fibers extracted from the husk of the coconut. Coir making is a laborious process but it’s widely popular for their bio-degradable composition and long life. Elephant statue, the State animal naturally finds a place. As it is not practical to take back a living specimen, you will have to be satisfied with a replica. The glittering ornament worn on the forehead of the elephant called Nettipattam is of regal lineage and looks. It is crafted from gold and copper. Nilavilakku is lit in the front courtyard to destroy the darkness in our minds before the lights are switched on. The lit lamp invokes blessings. From the awesome seashores along the Malabar Shore to the labyrinth of backwater pathways in Alleppey and Kumarakom to the fantastic verdant hillside tea gardens in Munnar, Kerala’s scenery and points of interest are almost as different and unique as its individuals and the lifestyle and record of the individuals of Kerala is a significant component in gaining the visitors from all over the world. Kerala doesn’t end here it’s too much engagement and fusion of things gives its extraordinary festivals and collection of handicrafts. Kerala over and above is a must visit. Who Loses to visit God’s country? So for what are you waiting for Hurry Up Plan Your Trip Now, get latest Cleartip Hotels Offers, MakeMyTrip Coupons, and Easemytrip Offers Codes at Paisawapas.com. Posted in Travel Tagged Adventure In Kerala, Backwaters Of Kerala, Beaches Of Arabian Sea in Kerala, Elephant Bathing in Kerala, Hill Stations Of Kerala, Kerala, kerala destination wedding, Kolukkumalai Tea Estate in Kerala, Meditation and Ayurvedic Therapies in Kerala, Monuments Of Kerala, Spice Excursion in Kerala, vacation in kerala, Waterfalls In Kerala, What are the reasons to visit Kerala?, What is the best time to visit Kerala?, What to buy from Kerala?